The York Maze 2013 season is in full swing and with an array of events beside the largest maze in the UK there are plenty of activities to entertain all. The York maze is now in it’s eleventh year and is one of York’s most popular tourist attractions, owing to the fact that they include many variations on the getting lost/finding your way theme on which traditional mazes trade. Season wide attractions include crazy mazy golf, quad bikes, an inflatable slide, remote control boats and curiously, pig racing! On top of all of the season long events, there are many themed days held at the maze site including the Sweetcorn Festival and World Sweetcorn Eating Championships (where audience participation is encouraged) and the Dog Day at York Maze, where displays of canine talent will be the order of the day. 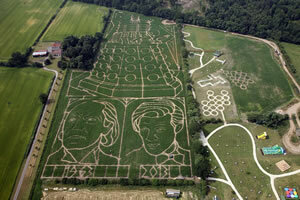 For more details of upcoming events see the York Maze events page. York Maze’s season finishes on the 2nd of September so be sure to make the most of the stunning weather and visit while you can. Discounts are available when booking tickets in advance online.